French Hostages Held In West Africa Since 2010 Win Freedom : The Two-Way The four, captives of an al-Qaida affiliate, will be on their way home soon, French President Francois Hollande says. They had been held since their capture at a uranium mining operation in Niger. 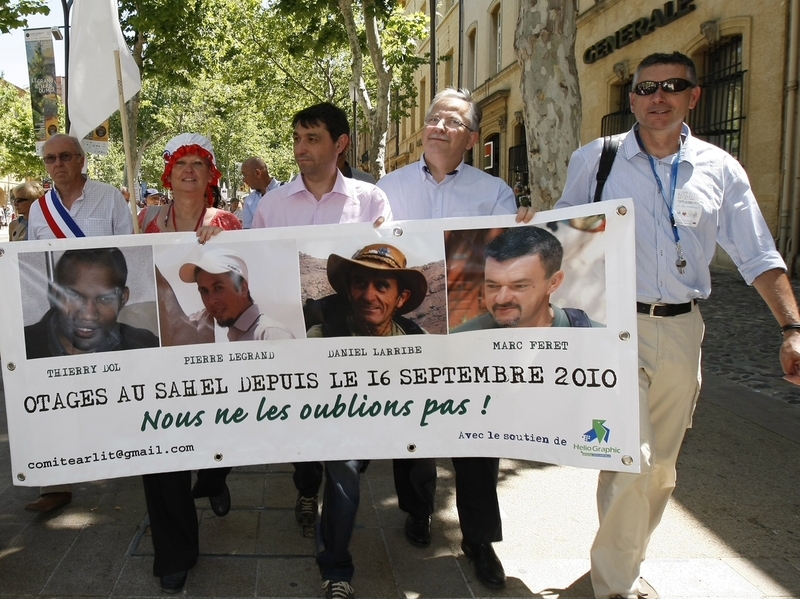 The hostages' families, friends and activists demonstrate in Aix-en-Provence, France, in June. Four French hostages captured in Niger three years ago by members of an al-Qaida affiliate have been released. France's President Francois Hollande says the men, seized in a raid on a uranium mining operation on Sept. 16, 2010, near Arlit in northern Niger, will be returning home soon. The four men are identified as Thierry Dol, Daniel Larribe, Pierre Legrand and Marc Feret. A source close to Hollande was quoted by AFP as saying: "We can't say that they're in great health but their health is fine." The hostages are thought to have been held in neighboring Mali. As NPR's Ofeibea Quist-Arcton reported in 2010, al-Qaida in the Islamic Maghreb claimed responsibility for snatching the four men. A French woman was also seized, as were two other men — from Togo and Malagasy. They were all working for the French Areva uranium mine. The woman and the two Africans were released in February 2011. Hollande made the announcement that the four had been released on Tuesday as he was visiting Slovakia.
" 'I want to express all my gratitude to the President of Niger who obtained the release of our compatriots,' he added, without providing further details." The BBC's Hugh Schofield reports that "friends, relatives and supporters of the four hostages ... knew the men were alive, but had no indication their release was imminent." He said the French government is "strenuously" denying that there was any ransom paid.